According to the good ol’ weatherman we were supposed to have calm seas 2′ at 9 seconds. I guess he took the TRICK part of Trick or Treat seriously on this Halloween Day. I decided to head for the canyon in search of sharks on light line again hoping we would have better action in the deep since we were supposed to have the right weather. The ride out was ok, but 5 miles from the Tip of the Wilmington, the wind kicked up out of the NNE and so did the seas. We had already made it out and saw plenty of life from birds to dolphins so we setup in the blue green 65 degree water just east of the tip of the Wilmington. It didn’t take long before we had a mako slip in past our teaser baits and eat Maureen’s light line rod and take off. After about a minute the line parted and it was over as quick as it started. We finished off this drift with an encounter from a small mako in the East Notch then headed for the elbow where the East Wall meet the Natural 100 fathom line. We hit the break here and were in 69 degree, blended blue, weeded water. Can’t get away from the weeds at all this year, but fortunately we weren’t trolling today. 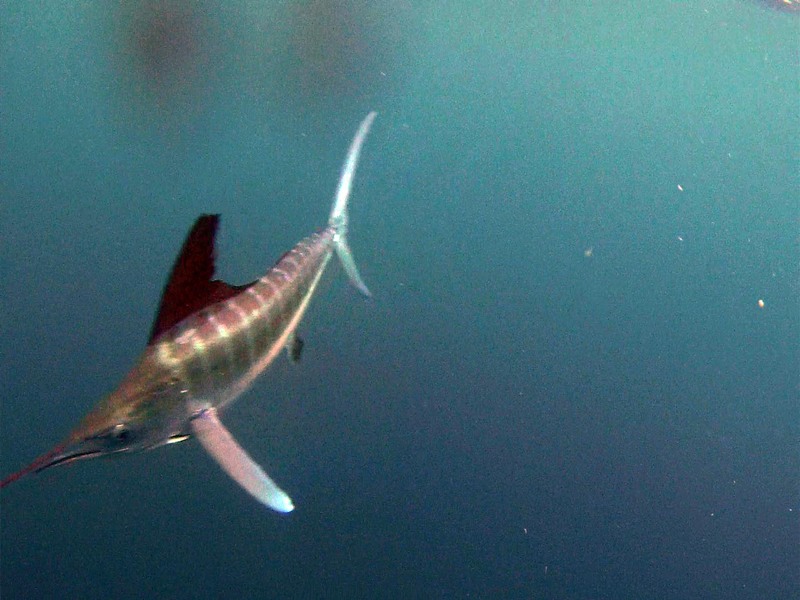 We drifted across to the mouth of the canyon and had a small white marlin try to eat our teaser bait. Another TRICK for us… that was all there was to this drift so we moved back into the West Notch which was the direction of home since it was getting pretty choppy out. Our last drift we had a small mako and a small blue shark come in to check things out and we pitched the spinning rod to them to have some fun. Around 2:30 we packed it up since we knew it was going to be a long ride home, and that is was, long and wet, but we got home safe. Two other boats were out that trolled the Spencer and Wilmington Canyon throughout the morning and mid day and all they had were a few mahi off the lobster pot balls. No Tuna… Here we go again with the nonstop winds throughout the upcoming week as it looks right now. Time to switch gears to Striped Bass!! !